Regional play during the 2016 GNBA season concluded over the weekend in Waukegan. After a weekend of 5th-8th grade action on the hardwood, a number of hungry and talented up and coming young 5th graders stood out and made their presence felt. A highly efficient post player, Brown shot 55.0 percent from the field this past weekend. He averaged 15.3 points and 7.0 rebounds per game, which rank sixth and seventh in the league respectively. Brown’s 24.7 mark in floor impact stands sixth in the fifth grade division, while his overall efficiency of 7.0 ranks ninth. You will not see Chapman among the league’s leading scorers, but he contributes in a variety of areas. This past weekend, Chapman ranked first in efficiency (23.0) and second in overall floor impact (37.7). Chapman also currently leads the league in rebounding. Oh, and he is his team’s leading scorer at 10.3 points per game. The OSA Crusaders went 3-0 in Waukegan in large part of Dotzler’s efforts. Dotzler was consistent across the board, averaging 13.3 points, 3.0 rebounds, 2.7 assists, and 2.3 steals per game. His big weekend resulted in a 9.3 efficiency rating, which ranks sixth in the league. His 2.7 assists per game also stands third in the fifth grade division. Perhaps the MVP of the fifth grade division, Hamilton had a monster weekend in Waukegan. Hamilton averaged 28.0 points per game, which leads the league, and 3.7 steals per game, which ranks third. His 39.0 rating also tops the league in floor impact and his mark of 14.7 in efficiency stands third. Hamilton produced across the board, averaging 5.7 rebounds and 1.3 assists in the regionals. Hamilton averaged 16.0 points, 3.0 assists, and 3.0 steals per game in Waukegan. Hamilton also shot an outstanding 70.6 percent from the field over a three-game span. He ranks seventh in floor impact (24.3), fifth in efficiency (9.7), fourth in scoring, second in assists, fifth in steals, and No. 10 in three-point field goal percentage (42.9) after a terrific all-around weekend. Perhaps the top performer in the league among big men, Kizer averaged 15.7 points and 15.7 rebounds per game in Waukegan. Kizer currently leads the league in block (1.7 bpg) as well. His 35.7 floor impact stands third in the division, while his 15.7 efficiency trails just one other player. Lecce had an excellent weekend shooting the basketball. Averaging 20.3 points per game on 51.5 percent shooting, Lecce ranks second in the league in scoring. 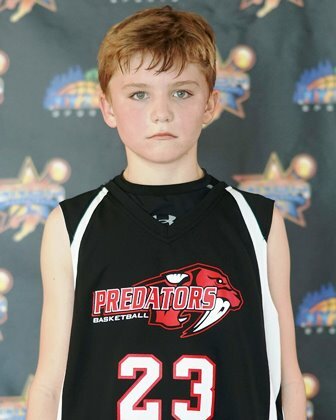 His 26.0 floor impact currently stands fourth in the fifth grade division as well. Lecce also averaged 3.7 rebounds and 1.0 assist per game in Waukegan. Weatherford scored the basketball at a high level during regional play. Averaging 16.7 points per game, Weatherford was the third-highest scorer in Waukegan. He shot 58.3 percent from the field, including 38.4 percent from three-point range. Weatherford also had a 21.7 overall floor impact, which ranks ninth in the league. Wrecke averaged a near double double this past weekend. On top of that, the talented big man is among the league’s leaders in floor impact (25.0), and efficiency (8.0). Wrecke ranks seventh in the league in scoring (14.0 ppg) and fourth in rebounding (9.0 rpg). He also gets it done at the free throw line, shooting 71.4 percent from the charity stripe, which stands fifth in the fifth grade division. Young helped lead Wisconsin United to a 3-0 weekend during regional play. He led the team with 12.7 points and 4.3 rebounds per game. He also averaged 1.7 steals and 1.3 assists per game from the forward spot. Young ranks fourth in the league in offensive rebounding (4.0 rpg), No. 10 in efficiency (6.3), and No. 10 in scoring. Note: Evan is a contributing editor for NY2LASPORTS.COM. He is also the football and basketball recruiting analyst for Badger247.